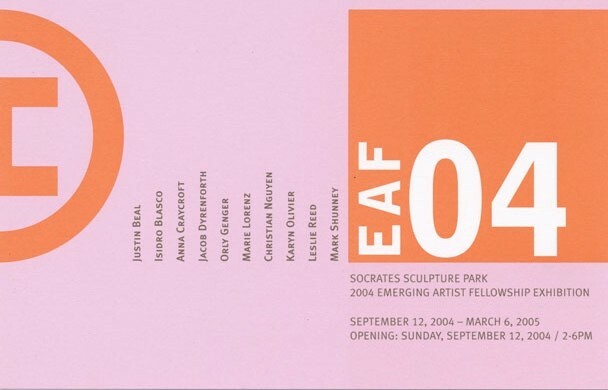 Socrates Sculpture Park is pleased to announce the opening of EAF04: 2004 Emerging Artist Fellowship Exhibition featuring new works by Justin Beal, Isidro Blasco, Anna Craycroft, Jacob Dyrenforth, Orly Genger, Marie Lorenz, Christian Nguyen, Karyn Olivier, Leslie Reed, and Mark Shunney. Through the Emerging Artist Fellowship Program, Socrates Sculpture Park gives artists the opportunity to pursue open artistic exploration and to create work on a scale that would otherwise be impossible to realize, especially within the confines of New York City’s limited affordable studio space. The program offers artists an important chance to expand both the scale and the scope of their practice at an early stage in their development while working with new materials and learning about the challenges and requirements of outdoor sculpture. Fellowship recipients are given financial support, a residency in the outdoor studio, access to the space, facilities, materials, and technical assistance to create new works for exhibition in the Park. Socrates is a laboratory where experimentation and innovation expand, reinvent and redefine the tradition of art in public spaces. This year, the Park is proud to introduce the first named fellowship, endowed by the Roy and Niuta Titus Foundation. The 2004 Roy and Niuta Titus Emerging Artist Fellowship has been awarded to Karyn Olivier. The Roy and Niuta Titus Foundation is an independent foundation that has been supporting arts and cultural programs for nearly thirty years. Since the Foundation’s reorganization in 1999 under the leadership of Suzanne Slesin and Michael Steinberg, one of its missions has been to support emerging artists through exhibitions and scholarships. This exhibition is made possible by the dedication and support of our volunteers and friends and by the generosity of: AG Foundation; Altria Group, Inc.; Lily Auchincloss Foundation, Inc.; Milton and Sally Avery Arts Foundation; Carnegie Corporation of New York; David R. and Vivien Collens; The Cowles Charitable Trust; Mark di Suvero; The Fifth Floor Foundation; The Horace W. Goldsmith Foundation; Jerome Foundation; Wendy Evans Joseph; JPMorgan Chase; Richard and Ronay Menschel; Ivana Mestrovic; National Endowment for the Arts; New York State Council on the Arts; The Pincus Charitable Fund; Brooke Kamin Rapaport and Richard A. Rapaport; Rev. Alfred R. Shands III; Mr. and Mrs. Thomas W. Smith; Janice Stanton and Ronald Windisch; The Roy and Niuta Titus Foundation; The Andy Warhol Foundation for the Visual Arts. This program is supported, in part, by public funds from the New York City Department of Cultural Affairs. Special thanks to the City of New York, Mayor Michael R. Bloomberg, Queens Borough President Helen M. Marshall, City Council Speaker A. Gifford Miller, Assemblywoman Catherine Nolan, Councilmember Eric Gioia, and the Department of Parks & Recreation, Commissioner Adrian Benepe. 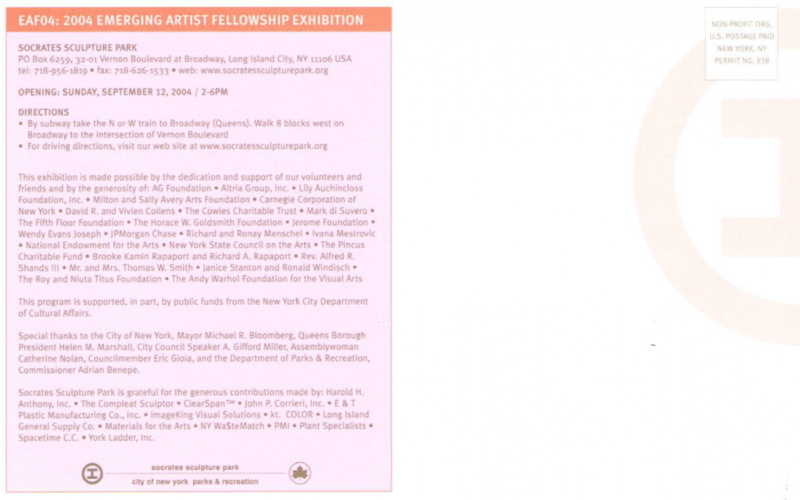 Socrates Sculpture Park is grateful for the generous contributions made by: Harold H. Anthony, Inc.; The Compleat Sculptor;¢ ClearSpanTM; John P. Corrieri, Inc.; E & T Plastic Manufacturing Co., Inc.; ImageKing Visual Solutions; kt. COLOR; Long Island General Supply Co.; Materials for the Arts; NY WasteMatch; PMI; Plant Specialists; Spacetime C.C. ; York Ladder, Inc.